So to fill you all in, Hudson's new catheter also did not work and he ended up having 3 surgeries within 4 days. (Somehow the new catheter quickly got stuck between his intestines and it wouldn't drain.) That was a VERY hard weekend for all of us but by the grace of GOD we made it through and his new catheter has since been working fantastic. A few days after being home post surgeries I started noticing Hudson wasn't taking more than an ounce or two of milk. At first we all thought he just went 3 days without hardly eating and his stomach area must be SO sore from all those surgeries....but I soon noticed he was started to loose weight and then one morning after dialysis his blood pressure was very low at 60. So we spent last Friday overnight in the hospital monitoring his blood pressure. 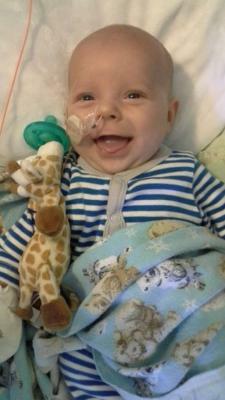 Hudson also had an NG tube put back in. He had this is the NICU when learning how to eat. The nurses showed Bryan and I how to put it in and feed him from it. Piece of cake but kind of a pain as the tube is always in the way. But after a week of taking half of his bottles by mouth and finishing the rest in the NG tube we can really see a difference. Hudson is really filling out and is SO much more happy and content than ever before. He is also sleeping 3-4 hours stretches at night. The nephrologist says PD kids just stop eating for whatever reason no one knows. 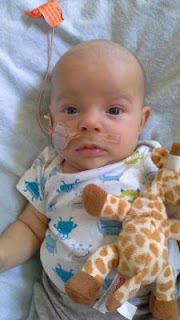 They have been mentioning to me for awhile now that he may need a g-tube but there just hasn't been the need for one. And now after all the surgeries he's had I definitely want to wait and just give him a break as the NG tube works just fine. Today we ended up having both the Neuro and Renal appointment on the same day. Only one trip to Riley but it made for a very long day for mommy and Hudson. Hudson was a trooper getting blood work done and then off to the Neuro appointment we went. We got a great report from the neurologist in that he seems to be right on track for his adjusted age. This is the same neurologist that sat with us (shortly after being transferred to Riley) and told us Hudson had just too much brain damage on his MRI. Well today she told me there shouldn't be any more MRIs unless for any reason he is having seizures or isn't meeting milestones. But for now he is doing great! She will monitor him his first 3 years due to the fact he did have a brain injury and we should only have to see her every 3-6 months. Our renal appointment also went great. His potassium is now normal, his creatinine is going down, his sodium is a little low so we are back to adding the sodium chloride supplement daily, but the best part is we are back to 10 hours of dialysis! We've been on 14 hours since surgery, which has been hard, and I was hoping for 12 today. Never have I been so excited to go back to 10 hours of dialysis! So we are back to our 110 mL for 10 cycles. This is where we were at before all those surgeries. Oh and somebody officially hit 10 pounds now that we've got feeding under control! Things have been going really well now that our new catheter is working so good and feedings are going at the amount they should be. 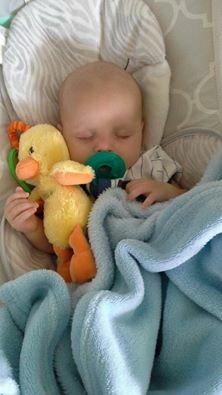 We hope to not be an inpatient any time soon as Hudson LOVES being home. He is so smiley, happy, and content being home as are we!